Tagged administrative bloat, branding, Kyle Henley. Bookmark the permalink. UC-Davis fired her after student and faculty protests over her $260K salary. Powered by Orange is a favorite bad taste in many mouths on campus. Not a bad slogan, perhaps, but it came at a time when non-youth were trying to wrap their heads around emerging social media. Units were asked – rather pointedly – to make social media content with faculty and staff to be telling the world “I’m Powered By Orange!” This at a time when staff were being directed to take furloughs, a time when staff were busy trying to explain to all who could help in that regard that staff are that which powers OSU, rather than the other way around. Just bad timing, I guess. University Day is a day-long celebration of all things OSU to get folks in the right mindset prior to classes in the fall. An invited keynote inspires (usually) and President Ray further fires up the troops, and Faculty/Staff award winners are announced. At the end of the event is a fairly popular raffle for door prizes, which is traditionally emceed and tickets drawn by the chief communicator. Folks actually show up to get their ticket, then stick around for the door prizes – some are pretty nice. The year of PBO, and, don’t forget, furloughs, LL emphatically, in an almost Dear Leader-like manner, made the holders of the winning ticket stand and yell to the rest of the auditorium, “I’m Powered By Orange!” Perhaps without saying, “Louder, I can’t hear you…” it would have seemed less surreal. Perhaps insisting that the holder of the correct ticket number must say it, or give his ticket away made it seem a little less spontaneous. Perhaps the not-well-hidden snickers touched a nerve of hers – I don’t know. That she managed to rub such a large congregation the wrong way with her tone-deaf insistence in sloganeering was not lost on a large number of campus communicators. Her ham-fisted dictums on a few unfunded “mandatory” rebranding efforts did not endear her to many of those communicators – several of whom like to point out they were on campus before, during, and most important in their storytelling, *after* her tenure, suggests she departed with still plenty of room left to work on consensus building across campus units, a process that has proceeded at a better pace across those same units, and many of the same people, since the arrival of her successor. At the risk of being trite, I’ll add a “To be fair” coda to this: under her tenure, many of the initiatives that happened did received CASE and other awards, which marketing and advancement folks like to point to as a form of metric for their work. CASE awards are not unlike other industry awards, such as EMMY for television, Golden Eagle for film, and a few others for advertising communications, and related fields. Having those first three myself, I will attest that the value of their prestige is not entirely proportional to the value of the work they honor. 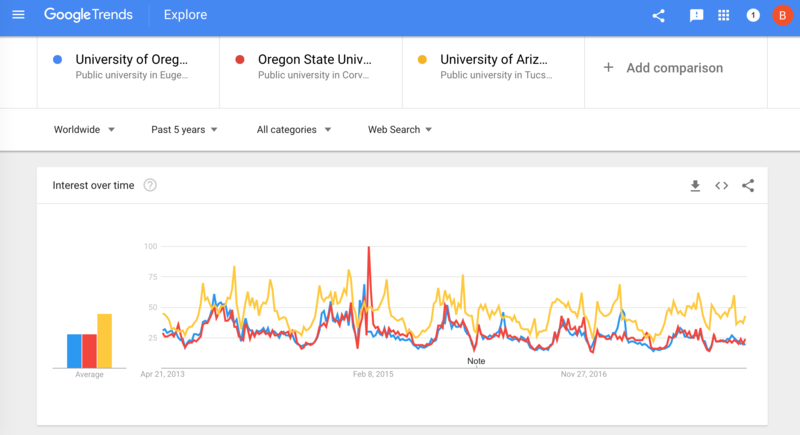 Marketing and advancement for a university is a bit of voodoo – it’s possible to create metrics for that work, and even show awards for it, that suggest something is being done; it’s another thing entirely to directly tie those efforts to the more important metrics of enrollment, retention, and 4-, 5-, or 6-year graduation rates. A colleague of mine from Maine, one of her pre-OSU career stops, when I shared that she was a part of the advancement team for OSU gave me the same response I gave above. Perhaps my evaluation of her campus presence during her tenure was biased by that warning guidance. Also noteworthy, OSU has a huge mountain to climb any time they try to attack deferred maintenance on the core campus, thanks in no small part to the designation as an Historic District, a designation pushed for by LL as an important feather for the marketing cap. A dozen years ago, there was a palpable “little brother” feeling on the campus, relative to a campus a bit more than two score miles south. Campaigns were planned around the historic campus – although, to her credit, there was an eye to a future sesquicentenary celebrate now underway. Right after the Historic District was designated, workers began putting up new signage for campus buildings – which was promptly stopped, as the any exterior modifications to buildings or ways needed approvals from a few off-campus agencies. As a direct result, plans for exterior refurbishing of several buildings, including Gill Coliseum, were put on hold, as they now needed approval from the historic commission. A painting project for Gill was held up while plans and colors were re-checked and justified under the district guidelines. So, too, was signage on that building. There have a been a few items on maintenance punchlists that would literally take an act of Congress to achieve now, as the historical commission types have indicated disfavor. It is nice to have a large chunk of campus designated as an historic district, but it was a major wrench in the core campus planning works at its implementation. But it looks good on brochures! For the record, VP Henley is not the “uncommunicative” one here — there is, in fact, nothing to communicate (and you will hear shortly from the PRO, if you haven’t already, that there are no non-exempt responsive records that can be released (as of yet). There has been a successful bidder identified (not the person referenced here in the comment section), but no contract has been awarded. The head of PCS feels strongly that we should not release information about a procurement until the contract is actually awarded, as premature releases of information compromises his negotiating leverage. While we thought the contract was soon to be finalized (hence the short delay in getting you a formal response), it is not yet done. 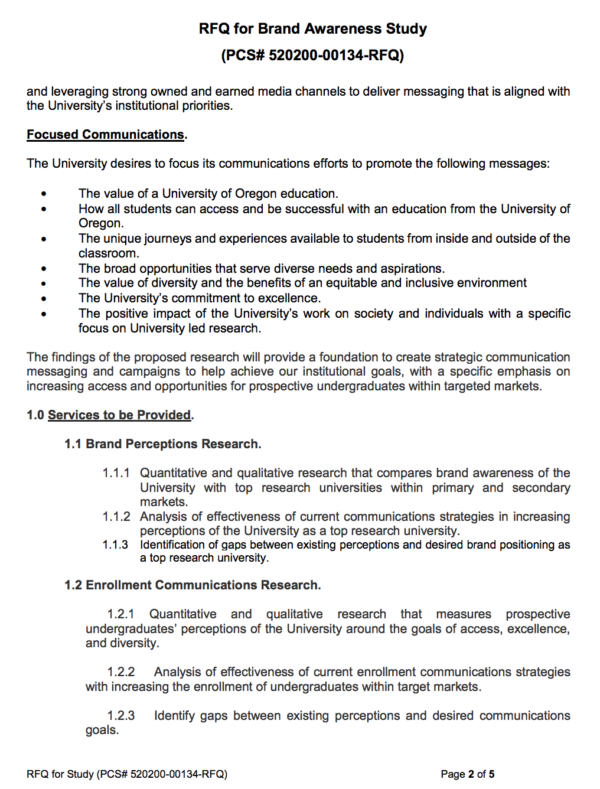 It’s great to hear that UO is not going to hire that failed OSU/USC/UC-Davis flack. Chalk another one up for the Fishwrapper. However, it seems like it might be a conflict of interest for VP Henley to participate in the negotiations of the terms of the consulting contract which will evaluate his own work, and affect his own potential contract renewal and raise. Luanne Lawrence has been meeting with communications administration and staff on campus over the past several weeks.